Reader Gut Reaction: When the cheerleaders and the geeks team up to try to solve a school group funding problem together, WHAT could possibly go wrong? That fabulous title ends up proving itself apt again and again throughout this hilarious and endearing book. I want to HUG this book I enjoyed it so much. Silly high school tropes like meanie cheerleaders and socially awkward geeks end up being turned on their heads when you mix in nice-guy jock Charlie—captain of the basketball team; a cute, smart geek girl; an estranged former best friend; and FIGHTING ROBOTS. Yes, there are battle bots in this book. I could not possibly love it more. I predict it will be a major Cybils contender, like author Faith Erin Hicks' 2012 Cybils winner, Friends With Boys. Concerning Character: The characters have perfect visual appeal as well as being loveable on their own, each for different reasons. Charlie—kind of the main character—is just an all-around nice guy who doesn't want to get on anyone's bad side. Unfortunately, he's going to be forced to piss SOMEONE off, through no fault of his own. When it turns out the school only has enough money to fund one thing—and that thing is either 1. new cheerleader uniforms, or 2. the cost of a competition for the robotics club—Charlie ends up in the middle. Fortunately for him, he just might have a plan that will satisfy everyone….except the parental units. All of the characters are funny and distinct. The cheerleaders are not just your stereotypical mean girls, but are sharp in general, and they're willing to do some pretty out-of-character stuff if it means they can get what they want. Nate, Charlie's neighbor and sort-of-friend, is that kind of neurotic, totally singleminded nerd that many of us will recognize. And geek girl Joanna is cute, smart, and, I'm pleased to report, the one who wins the day. It's an entertaining cast that fits the story perfectly, with some funny and surprising bit characters, too. Recommended for Fans Of...: Of course if you liked Friends With Boys (reviewed here), I highly recommend this one. 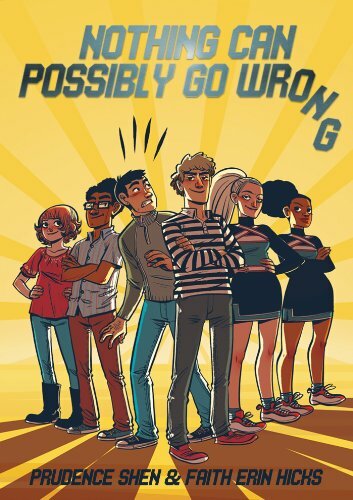 You'll also want to check it out if you enjoy graphic novel stories about high school life with a good dose of humor…The Plain JANES, for instance, or Americus (reviewed here), or Re-Gifters (reviewed here). Themes & Things: Cooperation makes strange bedfellows…and sometimes enables unexpected friendships, too. Also, teamwork can accomplish a lot more than enmity, and it's when the geeks and the cheerleaders team up that they really start to get things done. I like it a lot that, while there are some typical high school social strata and clique-related tensions, people are able to push those aside and be genuine, well, people, who can actually work together and communicate and use each person's individual strengths to be a truly formidable force. You can find Nothing Can Possibly Go Wrong by Prudence Shen and Faith Erin Hicks online, or at an independent bookstore near you, in May 2013! Yes, I enjoyed Friends With Boys (which I learned about here, thanks to you), so I will definitely pick this up. Love the premise! I LOVE graphic novels of high school life. I read THE PLAIN JANES and JANES IN LOVE. Oh, great--if you liked Friends With Boys I'm sure you'll enjoy this one. It had a very positive feel to it, which in this day and age of constant bullying overload, was refreshing without being cloying, if that makes sense.